I'll Bee II is my latest creation! This image is a revisit of one of my very favorite composited images. This image was created entirely in Photoshop CS5, for which I have been fortunate to have been chosen as a beta tester. This new version of Photoshop has just been announced and we have been allowed to display our work as well as discuss some of the cool new features. I have incorporated several of the new features including some very cool 3D tools. This image is composed of 4 photographs. The background is a blurred image of a field of mustard. 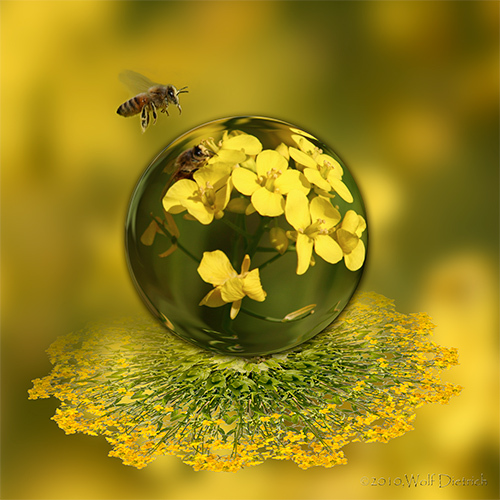 The sphere is made up of many instances of a circular selection of a mustard flower bunch and bee. The floating mustard flower bouquet is made of an isolated mustard flower bunch, copied, stylized and transformed into a four-flower bouquet. Then it was rotated, sligthly clockwise, and repeated several times on layers to form a circlular bouquet. This series of layers was then stamped, processed with 3 D features and a layer mask to suggest the float. The large bee was isolated from a fourth image. This image was allot of fun to create and the new version of Photoshop is a pleasure to use. I was very happy with Photoshop-CS4 and didn't think that this awesome product could be made even better! I am one of those Photoshop nuts who just has to spend at least a few hours every day creating something, ever since Photoshop 4. A composited image, such as this one, expresses my favorite passion. Also, as is obvious from the images displayed on this site, I have great pleasure optimizing my photographs. I have also been a member of NAPP since 2002.